If you’ve always dreamed of a super-effective way to get smooth legs that’s so easy, there is no way back. And if you already did some research and came to the conclusion that Braun Silk Epil 9 is the best epilator on the market then you know that there are many different models available..
We did all the extensive research figuring out what are exactly the differences between each type of the Braun Silk Epil 9. So you can chose the one that fits your needs. This posts only reviews the Braun Silk epil 9 and it’s variations. If you don’t know yet if you want to go for the most advanced (= highest price) series of Braun and want to see which other models are out there. Go to our best Braun epilator page. We created a dedicated post where we compare all the different models to guide you in your research. That being said, let’s start the review. What is extra about the Skinspa editions compared to other editions. The Silk-épil SkinSpa is a complete 4-in-1 epilation, exfoliation and skin care system. So basically with the skinspa edition you get 3 extra brushes to put on. To take care of your skin. (2 Exfoliation brushes & Skin Care system). If you come across the versions 9/980 and 9/970 these are the older models and are currently not available anymore. Hairs stay away for a long time, you will find out that you have very little hair if you epilate about once a month. This is because of the new MicroGrip Technology. This exclusive Braun Silk Epil 9 technology is a new way arrangement of tweezers that allows the finest hairs to be obliterated. This means for you that nothing else will give you a smoother shave and your hairs grow back differently than if you were using other hair removal products like for example wax. Your hairs will feel less “prickly” when they re-grow and they become softer and finer compared to other hair removal tools, this gives you silky feeling legs. The head of the braun silk epilator is 40% wider than any other model Braun has ever made this is helpful because it actually takes a lot less time to do both your legs. So less nagging about you being in the bathroom all the time. It becomes painless when you get used to it, but the pain is always bearable. One of the main strengths of Braun epilators is that most of them are 100% waterproof. The underwater epilating function will really help you reducing the pain in sensitive areas like the bikini or underarm area. This saves you a lot of time and pain of cleaning up your removed hairs. The new pulsating action of the epilator is one of the most loved features by woman, it makes you feel that epilating is a lot more comfortable because your precious skin is also massaged as you go along. This reduces the pain factor a lot of people complain about while epilating though Braun in my experience is one of the epilators that doesn’t feel like an epilator anymore, this is a whole new level! If you combine the exfoliation head with this massage function you will be able to buff off dead skin and deal with the problem of potential ingrowing hairs. This function alone makes this epilator a premium epilator according to everyone that were able to test this epilator. Do you have sensitive skin? If yes, this is the epilator for you. Because it doesn’t pull the skin in the process of epilation there is almost none irritation. You won’t scream like a baby when you use the epilator for the firs time, it is really bearable compared to the other ones. Personally, my skin is irritated and red for approximate 1 hour, then it goes away. They claim there is no irritation but this is impossible. In the end you will actually save money with using this epilator. Why? Because you will never have to buy another wax strip or a disposable razor again. This doesn’t only save you a lot of money but it also helps the environment. Another beneficial feature of the epilator is the Smartlight function, it illuminates the area you are epilating. This means for you that you can epilate anytime because with the light, you can’t oversee a hair, and another great benefit for you is that you can use the epilator at night. It also helps you to epilate areas that are in complete darkness like the underarms or other dark areas of your body. Like all other Braun epilators the braun silk epil 9 also has a pivoting head. The benefits for you is that this feature ensures that it runs smoothly over the contours of your body. This means you will have a cleaner and faster epilation session. Another life-saving feature is the automatic on-off switch this ensures that the epilator can only be used when it isn’t plugged into a power source or sitting on its charger. This is extra protection against electrical accidents. It is cordless and if you charge it for just 1 hour you can epilate continuously for 40 minutes. You get a cooling glove to prepare your skin before you shave and also to soothe it once you’re done. Lastly, this epilator is designed to use on your face, underarms, bikini area and legs because it has so many attachments. Included in the box is a shaver head, trimmer cap, high frequency massage cap, skin contact cap, facial cap and a charger. Is there anything not to like about the Braun Silk Epil 9? As a matter of fact it is hard to come across anyone who has used it and not liked it. So far, we have only found one 3 star review and the only reason this person wasn’t satisfied was because she doesn’t like the packaging – it is true, it comes in a bag and you just throw everything in. If you don’t mind that you will be perfectly happy with this new model from Braun. In addition to the powerful features, it is interesting to note the other things that users say they love. Some people say they love the fact that it is a lot quieter than other epilators they have used. Others say that they love the fact that it is so easy to clean. Many people say that they are impressed by the fact that they get an epilator and a shaver in one device and one user even says that she loves the way that it looks. Conclusion: The Best and Most Painless Epilator! 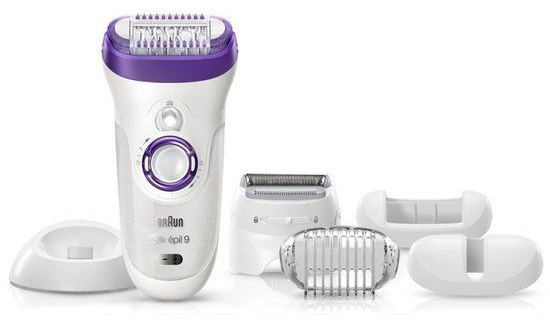 The Braun Silk Epil 9 is by far the best epilator for women in the market yet. It has features that allow painless, faster and smoother shaving than others in its price range and judging by customer comments, they are far more impressed with this epilator that others they have used in the past. The newest generation includes this SensoSmart™. It is an intelligent sensor that will guide your epilation, ensuring the right amount of pressure is applied to remove even more hair in one stroke. There is a red light that flashes when you are pushing too hard on your skin, so you exactly know how hard you need to press. The main difference between this model and the other Braun models is that it has a 40% wider head. This means that you can remove a lot more hair in one stroke and epilate your hairs even faster than before.